Leap the Dips was a roller coaster which stood on the east side of the Clinton River between Dickinson and Crocker, on what was once the Lonsby Lumber Yard. Martin Crocker owned the property and sold it in 1908 to Charles L. Alexander of Indianapolis. In the spring of 1909, the Mount Clemens Monitor noted that the city engineer was looking at designs for an electric park to be constructed at the site, and that mysteriously large lumber deliveries had lately been observed there. In June, more information was forthcoming; a roller coaster with all sorts of secondary attractions, as well as a twelve-foot boardwalk along the river, was promised to open to the public around the Fourth of July. The layout of the coaster is shown on the 1909 Sanborn Fire Insurance Map of Mount Clemens, where it is identified as the Dip the Dips. The attraction opened as promised on July 4, 1909, and enjoyed a large patronage. Two weeks later, the newspaper identified the coaster by its actual name, Leap the Dips, and remarked that ten barrels of paint had been used on the structure. Leap the Dips was further described as having a length of 3,200 feet. The novel attraction enjoyed great initial success. The Monitor observed on July 23, 1909, that two or three saloonkeepers are setting up a heart rending wail because of what Leap the Dips is doing to them. Apparently, business at the local taverns was suffering as merrymakers experienced a new kind of high. Only one season later, the Monitor reported that business at the roller coaster was flagging, because the newly-opened Bijou Theater was drawing crowds away from the amusement ride. The newspaper observed that the program at the theater provided endless variety, while one ride on the Dips is just like another. More trouble was in store for the novel amusement. In 1912, Martin Crocker sued Ingersoll Engineering and Construction Co. of Pittsburgh, builders of the ride and assignees of Charles Alexander, because payments on the land contract were in arrears. The Monitor scornfully observed that the coaster had done a good business for a short time, but now bears the general appearance of a dead one. Lot of good lumber there. 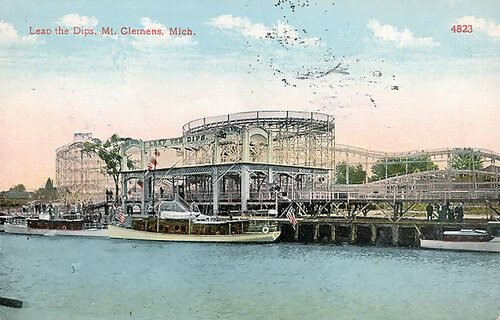 In May of 1912, the Mount Clemens Amusement Company was organized to operate the roller coaster and other attractions. Martin Crocker was the principal shareholder and minority shares were held by Barney Diehl, F.
C. Miller and Sabin Crocker. Others who were associated with the amusement company in 1916 were Ludwig Simon, cashier and financial manager, and Edward Bellor, mechanical superintendent. Leap the Dips quickly fell out of favor and into disrepair. The coaster was declared unsafe in 1923 and was dismantled in 1925 when the city advanced plans to develop a park on the site. 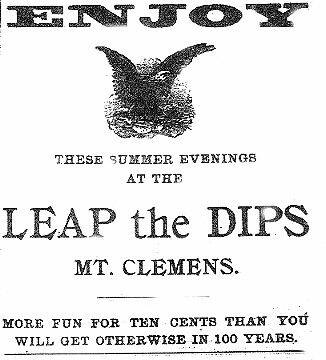 Today, the site where Leap the Dips stood includes the parking area for the Mount Clemens Municipal Building and the riverfront gazebo. It is hard to say how extensive the park was, but there was definitely a sizeable roller coaster there as the pictures show.